Accra, July 9, GNA - President John Agyekum Kufuor on Friday announced that with the International Monetary Fund's (IMF) award of Highly Indebted Poor Countries (HIPC) Initiative Completion Point, at least 3.7 billion dollars of Ghana's debt would be written off. 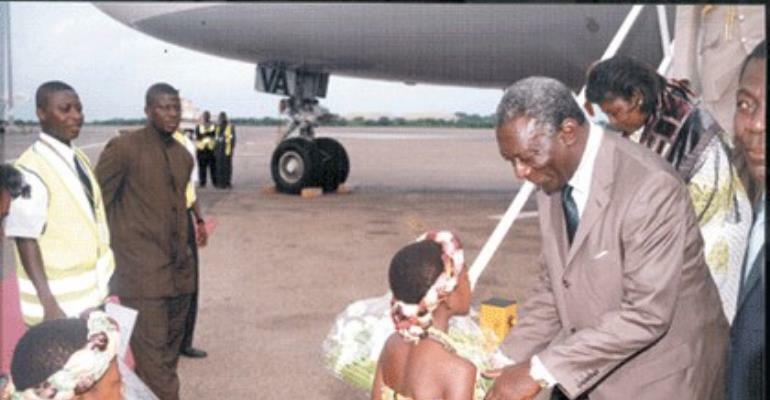 President Kufuor was speaking to Journalists at the Kotoka International Airport on his return from Addis Ababa, Ethiopia, where he attended the Third Ordinary Session of the African Union (AU). Nana Addo Dankwa Akufo-Addo, Foreign Minister, Dr Kofi Konadu Apraku, Minister for Regional Cooperation and Mr Kwabena Agyepong, Presidential Spokesperson, accompanied him. Earlier on Nana Akufo-Addo told the Journalists that peace and security in Africa were highlighted at the meeting. He said it was agreed by member states that there was the need to step up peace initiative in all trouble spots on the continent, especially Cote d'Ivoire and Darfur Region in Sudan. He said UN Secretary General Kofi Annan convened a meeting, which was attended by Nigeria, Benin, Togo, Gabon, Ghana and Cote d'Ivoire during which it was decided that the peace initiative must be elevated. He said at the end of July, a meeting would be convened in Accra, which all combatants in the Ivorian crisis were expected to attend. He said the Summit decided to set up a Common Security and Defence Policy for Africa Committee, headed by President Kufuor, to draft a policy to that effect. He said in the entire Summit focused on serious issues confronting the Continent, such economic development, HIV/AIDS among other things. Nana Akufo-Addo said the location of other organs of the AU in various places of the Continent was to further step up unity, stressing that the AU Parliament has been sited in South Africa while other organs would be sited in other countries.